Pretty Pink Posh and Altenew Collaboration Blog Hop! Hello and welcome to the Pretty Pink Posh and Altenew Collaboration Blog Hop! I love collaboration blog hops! They give me the opportunity to showcase products from some of my favourite companies. Altenew is one of my favourite companies and so is Pretty Pink Posh, otherwise I wouldn’t be working as one of their design team member, right? Okay, without any further delay, here is my card, made using some of my favourite Pretty Pink Posh and Altenew products. I started with the new Royal Garden Mix sequins from Pretty Pink Posh as my colour inspiration. I love the pinks, brown, burgundy, green and gold combination in the mix, because are bold, rich and beautiful. Love them. With those colours in mind, I stamped the flowers from the new Golden Garden Altenew stamp set on a white card front. I really love the colours on my card, especially the gold accent in the decorative tag die, the gold embossing and the gold sequins in the mix. Just beautiful. Hope you like it! Your next stop is the gorgeous and talented Anna Kossakovskaya‘s blog. If this is your first stop, then here is the list of all the design team member from both companies participating in the blog hop. Make sure you leave some love on all the blogs. There are two $30 gift certificates each from both Pretty Pink Posh and Altenew to giveaway. Please comment before Monday, Oct 26 11:59 EST. Winners will be announced on the PPP and Altenew blogs. I love the layers and the vibrant colors. just beautiful. I love your BG! TFS! Sow! Such a pretty, classy card! Love the touch of gold! Great card! Love the colors!!! Your card is beautiful Gayatri. Thanks for the great, creative inspirationan! Beautiful! I love all the gold details. The colour combo is so fresh and the composition of the card is perfect. Juat lovely. Wow !! What a gorgeous card Gayatri ..Love everything about it !!! Your talent is amazing I love the color choice. Such an elegant card. You are a layering genius. The colors are wonderful and I love all of the layers! oH wow!! The colors you used on this are so rich and elegant. I love the layering and the way you created the background- just stunning!! Beautiful card Gayatri and such a vibrant color combination! That sequin combo matches the inks brilliantly! Love it! Love the bold colors with the gold – such a beautiful card. Lovely card, the background is elegant and the colors you used compliment each other beautifully. 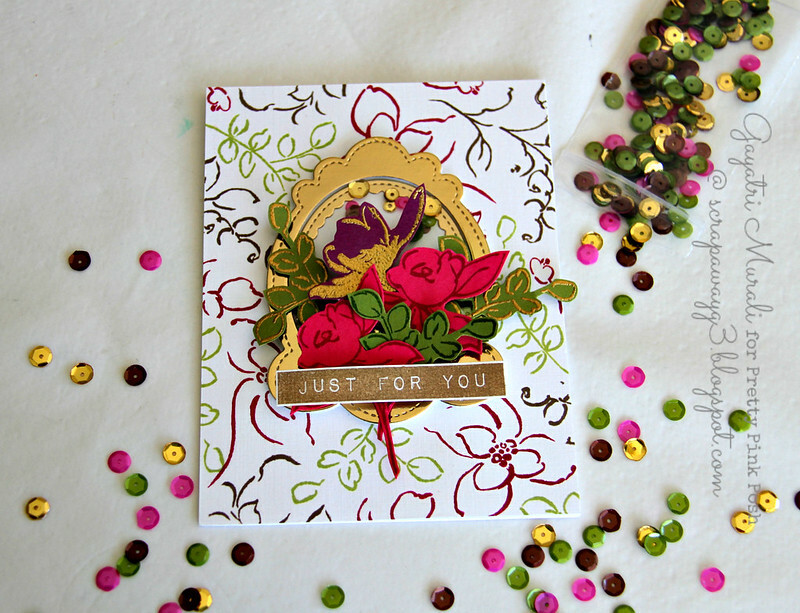 Such pretty bright and bold colors on your flower…that tag is gorgeous die cut in gold. Your Golden Garden background is beautiful. Love the colors from the PPP sequin collection. Such a pretty card. Great colors on your card. You can tell a lot of work went into this card. Gorgeous cards….love all the layering. I love using the tag die as a small shaker element on your card. The flowers are so vibrant. Lovely. Beautiful card! I love the artsy look and feel! Gorgeous! Pretty card! I love the gold and flowers together. Love the bold colors and the shine. Wonderful patterned paper background and I love the gold embossing! Altenew and PPP = a perfect match, and your beautiful frame+flowers is 100% evidence that this is true! The card you made is a true beauty, and quite a wonderful melding of the two companies. I never thought to sort of “clump” the sequins. I like that look. As you already know, I am a big fan of your cards… And this is one is no different… The creativity is just beautiful….. Would love to see your many more awesome cards…. As I sit here with my mout hanging open reflecting on the sheer gorgeousness of this amazing card, I wonder, why didn't I think of that??? Kidding, actually just stunned by this beauty. Such a beautiful card Gayatri!! Love all the gold.. Such a beautiful vibrant card! thank you for the inspiration! LOVE the PPP frame in gold! Your card is so vibrant and festive…and the addition of PPP sequins and fancy tag is just perfect. Gayatri: This is a fantastic card. The background is so aerie and beautiful. Beautiful. Beautiful card! Loving the colors you chose! Gorgeous, rich and very elegant!!! Very elegant! love the background pattern! Always gorgeous! The colors you chose are so rich. I love the raspberry jam and green with the gold. Love the paper. Beautiful card! Such lovely cards. Love the gold theme! Absolutely gorgeous. I wish I had just a teensy bit of your talent! Thanks. The PPP die pairs perfectly with that Altenew stamp set. Lovely! Very pretty! The colors are wonderful with that gold frame!! Lovely bright colors used… Love the colorful sequins too. That PPP frame is gorgeous in gold! What a unique & beautiful colour arrangement. What a lovely card! Such a great hop! Thank you! Love the gold glitz on this card! Beautiful! 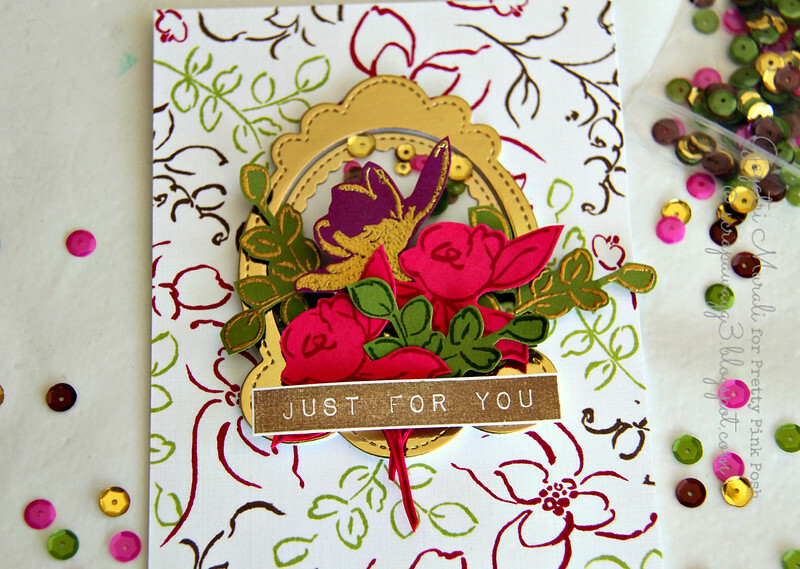 Beautiful card, just love the background you created and all those layers with gold is amazing!! Love the layers and the gold accents! Nice. Lovely colors–both ink and sequin mix. Wonderful layers and stamping on this pretty. Gorgeous!! Love the gold tag, I need to try that!! What a beautiful card you have created with these new supplies! I was so surprised that the flowers were individual….they look so perfect I thought it was a big stamp! Gorgeous work! my goodness your card is stunning! Love that card. So bold and beautiful. 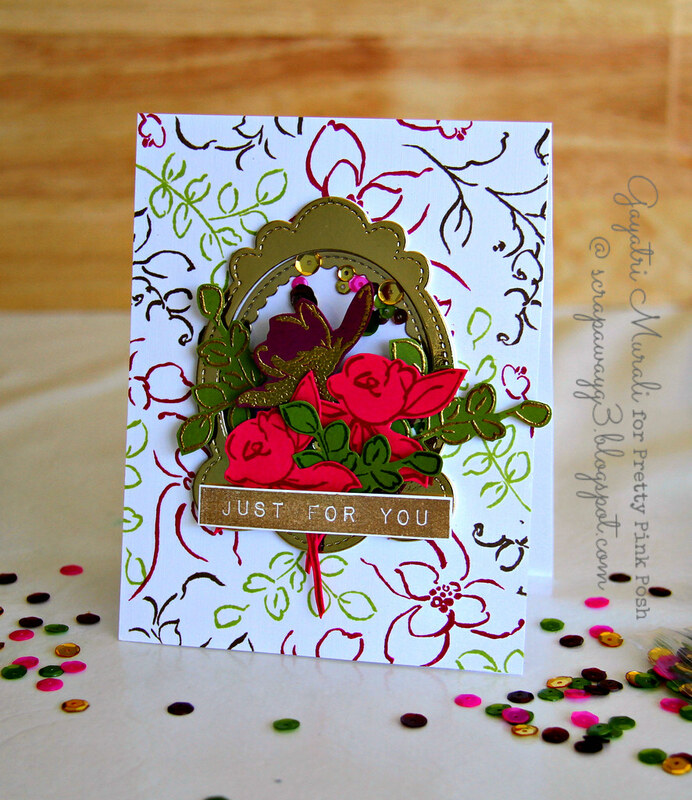 Gorgeous, rich colors…beautiful card & layout! Nice card. Love the colors used. Absolutely gorgeous! The new garden mix of sequins is divine. I must order some right away. Your card is stunning. I love all the elements. Thank you! I love the decorative tag in gold. Oh my, Gayatri this is stunning. Those gorgeous sequins beside your lovely card are JUST as pretty. Love your card!! Beautiful ! What a pretty card! Love the sequins! Beautiful card. Love the background and the cholors you chose. Thank you for sharing your ideas. Gorgeous card! Love how you created the background and the gold frame is so elegant! I just love the gold frame, the flowers look amazing with those lovely, vibrant colors. Beautiful card, thank you for sharing. I too love the colors of your card! and matchy, matchy sequins too!! I love your colors also! Very creative and beautiful! WOW! Your card is gorgeous. I love the cluster of flowers around the frame, and the stamped background. I love the layering of florals within that frame! Oh, your card is so eye-catching – love the background and gold frame!! I love the colours you have used!! Very regal! I love the background on this card…beautiful. I love the way you used a small shaker frame as the focal point of the card. So pretty! !, really love these colors! Love all the bright colors.very pretty card. Wow! What a colours! This card is soo amazing! Thank you, Gayatri! Such a gorgeous layout and I so love the color combo that you used! Thx for sharing!! I love the colors on your card! Great combo! Wonderful card! I love the sequin mixes from PPP too 🙂 Great idea for your color inspiration! Beautiful card with lots of inspiration, thank you for sharing! Love the new stamps- so many layers and they look beautiful. Gorgeous color combination. I love the gold frame. Beautiful. I love the gold framing and the pretty flowers. They pick up the design of the background. so beautiful!! LOVE the golden accents!!!! Your background of outline flowers is super. Really beautiful card!! Love your background!! Lovely Gayatri!! Your cards are always beautiful!! This is one of my favorite Altenew stamp sets these days. Beautiful card. Love the way you used the stamp as a background. Lovely card. Really pretty. Love that gold frame! Just wow Gayatri! Love the colors and the frame around the gorgeous blooms. Love your glitzy design, Gayatri! That gold frame is something I just may “need”!! Stunning card! Love the vibrant colors, gold frame and sequins details! Lovely card and the colors you used are very pretty–the sequins are the perfect touch! Love the layers and colors and the pretty details! Lovely! Great gold card! Love it! The gold frame looks gorgeous against the stamped background. Beautiful! I really like the use of colors and techniques. The flowers coming out of the tag inspires me to make ornaments. The gold embossing just takes the card to the next level. What a bold and beautiful color combination on this card! I love the way you repeated the colors in the inks, cardstock and sequins! Thanks so much for sharing! This is such a stunning and beautiful card! Great card! TFS! Gorgeous. I love that background. LOVE your colours, LOVE your background, LOVE your BEAUTIFUL layers, LOVE your GLORIOUS golden accents too!!! So gorgeous…love the bold colors. Love your colors, so cheerful! Super pretty colors and gorgeous layering! So festive! I'm loving that PPP die. Very elegant! Very much like the color! Love the gold! Great color combo! How beautiful! It's very royal and elegant looking with the gold. OMGoodness, this is beautiful! The gold looks so elegant and I love the vibrant colours! Oh This is so elegant! I love the bright colored sketchy background in your card. Love that new frame, especially in gold! I really love the colors you used also. The background might be my favorite part though. What's not to love? Gorgeous colors and design! Great job! I loved the colors! Beautiful cards Gayatri. Love the rich colors and the gold frame. So elegant. Oh my goodness your card is stunning! I loved it when I saw it first on Instagram!! Love your beautiful card and especially the gold frame! Gorgeous card; love the background and the rich colors used on it. Beautiful!! Love the color combination. What a wonderful card. Thanks for sharing.